Carvings, Reliefs, Statues of Celtic Deities: Turoe Stone, Celtic High Crosses. Ultimate La Tene Style (c.800 CE). 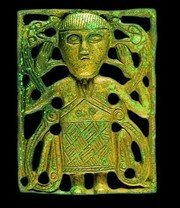 Given their preference for abstract or stylized forms, it is scarcely surprising that the Celts should have left us comparatively few images of their gods. Most of the finest examples of Celtic sculpture involve disciplines like metalwork and jewellery art, as well as stone carving. Of the stoneworks, many of the finest surviving examples were placed in or near important burial sites. Pride of place is usually given to depictions of Cernunnos, the horned-god, since he is the only deity that has been positively identified through an inscription. This was discovered on a rather worn altar relief, originally located beneath the present-day church of Notre-Dame de Paris. The monument was erected by Parisian sailors and was dedicated to Tiberius. On the strength of this, a number of other portrayals of the deity have been identified. The most notable of these is a Gallo-Roman altar from Reims, whieh shows Cernunnos sitting cross-legged between the figures of Apollo and Mercury. The sculpture dates from the 1st century CE, after Gaul had been Romanized. This accounts for the overtly classical appearance of the group. Even so, several of the god's traditional attributes are clearly recognizable. These include his horns, the torc around his neck and the animals at his feet. In his lap, he holds a sack of money, which represents abundance. The rat above his head relates to the underworld and, in this instance, probably refers to Mercury rather than Cernunnos. The horned god was most popular in Gaul, although evidence of his worship has also been found elsewhere. On some of his shrines, the deity's antlers were removable. This implies that the rites associated with him may have been seasonal, coinciding with the natural growth of a stag's antlers. from Etruria and Ancient Greece. After Cernunnos, the most widely represented deity was the horse-goddess, Epona. This may be due to the fact that, alone of all the Celtic divinities, she was worshipped at Rome. In most cases, Epona was shown riding side-saddle on a mare or, alternatively, standing between a pair of horses. On coins, she was occasionally represented as a horse with a woman's head. The goddess represented fertility, particularly in relation to horse-breeding, but she was also linked with death. On some images, she was portrayed with a key. One of her roles, it seems, was to conduct human souls to the Otherworld and the key symbolized her access to this legendary realm. Predictably, the cult of Epona was especially popular with cavalrymen. Her name is the source of the English word 'pony'. Regrettably, many of the surviving items of Celtic religious art (sculpture) can no longer be identified. Nevertheless, they can be classified under a number of different thematic groupings. It is noticeable, for example, that many Celtic deities had zoomorphic overtones. Cernunnos himself was often represented with cloven feet, and this tendency can be discerned in a variety of other figures. The tiny sandstone statue from Euffigneix in eastern Gaul (1st century BCE) is particularly striking. Measuring just over 25cm, it was probably intended for private devotions, rather than for a larger tribal shrine. The stylized face has been damaged but this is overshadowed, in any case, by the spirited depiction of a boar on the front of the figure. Its dorsal bristles are erect, an aggressive feature which normally underlined the creature's role as a war symbol. On one side of the statuette, there is also an outsized carving of a single human eye, its prominent eyebrow echoing the line of the boar's crest. No one has been able to find a satisfactory explanation for this combination of motifs, although the figure is sometimes thought to represent a hunting god. Sculpted from bronze rather than stone, the curious figure from Bouray (50 BCE - 50 CE) falls into the same category. A cursory glance might suggest a classical source, but closer examination reveals not only the torc around the neck, but also the figure's awkward, squat-legged position. The tiny legs, which are out of proportion with the rest of the figure, resemble the hooves of a deer. Indeed, if it were not for the complete absence of antlers, it would be tempting to interpret this as a depiction of Cernunnos. The figure was dredged out of the River Juine, to the south of Paris, in 1845. It was fashioned out of sheet metal, and it seems quite possible that its designer was a specialist cauldron-maker. Certainly, there are some stylistic affinities with the figures on the cauldron from Rynkeby. Many of the other worthies represented by Celtic stonemasons take the form of pillar-statues. This reflects their original purpose, which was to crown the summits of ancient burial mounds. One of the oldest discoveries in this vein was the life-sized figure of a warrior, carved out of sandstone, which was found near the German tomb of Hirschlanden. The statue dates back to the 6th century BCE and was originally placed at the top of the barrow, until it was broken off at the feet. Its various attributes - the conical helmet, the weighty neck-ring, the dagger hanging from a belt, and the erect phallus - were all designed to emphasize the heroic status of the princeling in the tomb below. The distorted facial features are sometimes thought to represent a mask. The stone monuments at other Celtic burial places offer variants on this theme. At Pfalzfeld in the Rhineland, the stele takes the form of a tapering, four-sided pillar. This was decorated with a series of stylized human faces, each with a leaf-crown headdress and a lotus-bud carved on its forehead. The emphasis on various plant forms suggests that the pillar may have been intended as a representation of a sacred tree. The shaft of the pillar is broken at the top, and it is likely that it was once surmounted by a larger version of the stylized heads. Janiform figures provided an alternative format for the pillar-statue. With their ability to gaze out in two directions at once, Janus heads were particularly appropriate for the tops of tumuli, dominating their entire surroundings. The best surviving example is a sandstone pillar-statue from Holzerlingen. This is slightly more than life-sized and shows Celtic stylization at its most severe. The mouth is nothing more than a horizontal gash and the heavy, hooded eyes exude menace. Unlike the Hirschlanden figure, which was meant to glorify the occupant of the tomb, this is clearly a deity of some kind. By tradition, Janus figures fulfilled a protective, custodial function, and this may well have been the intention here. Originally, there was a horn-shaped protrusion between the heads. It is not clear whether this was a variant of the leaf crown, as seen on the Pfalzfeld pillar, or whether the deity was actually horned. Smaller janiform figures have also been unearthed at the Gaulish shrine of Roquepertuse, in Provence. Here, the finds consist solely of heads and there can be no doubt about their watchful purpose. They were designed to be placed over a doorway or entrance. This is confirmed by the fact that there is no modelling on the sides of the sculpture, emphasizing that it was never meant to be seen from that angle. At an early stage, the heads were painted and, as is so often the case with Janus heads, the two faces are different. The frown on one of them is rather more intense than the other. The sanctuary at Roquepertuse was thoroughly excavated in the 1920s, offering a rare insight into Celtic ritual practices. It may date from as early as the 6th century BCE and it was in continuous use for several centuries, until it was destroyed by fire at the start of the 2nd century BCE. At the entrance to the shrine, there was a portico consisting of three limestone pillars. These contained niches, where the skulls of defeated enemies were triumphantly displayed. Similar activities were carried out at Entremont, another Provencal retreat. This featured the same arrangement of severed heads, nailed into cavities in pillars, but at Entremont there were also a number of carvings of these grisly trophies. On these, the faces had no mouths and were shown with their eyes closed, pointing to the fact that they were dead. At Roquepertuse, archaeologists also made a number of other discoveries: a series of carved birds, a crudely executed frieze of horses, damaged statues of two cross-legged figures, and traces of animal paintings. Originally, there were five statues, perhaps mounted on pedestals. The remaining pair have lost their heads and arms, making it hard to determine their initial purpose. It is likely that they represented either heroic soldiers or war gods. Hections of armour can still be discerned at the top of the torsos and, like the Janus heads, the figures were once coloured. It has also been suggested that the missing hands may once have presented severed heads towards the spectator. This theory is based on comparisons with the Tarasque de Naves, a chilling sculpture which portrays a ravening monster, probably a form of lion, holding two severed heads beneath its paws. From its jaws, a human arm dangles lifelessly. A similar creature was found at Linsdorf, in Alsace. In both cases, the inspiration is thought to have come from classical funerary art. The Romans often used scenes of animals devouring humans in this context, to symbolize the triumph of death. Comparatively little wood-carving has come down to us from the Celtic era, largely because of the perishable nature of the material. The majority of the surviving pieces are votive figures, which were cast into the water at sacred springs or river shrines. Unlike the magnificent weapons and items of jewellery that were discarded at other sites, these wooden figurines were usually plain, cheaply made objects. They were also deposited for a very specific purpose, namely to invoke the healing powers of tutelary deities. The most important healing shrines that have come to light are both in France, at Chamalieres in the Massif Central and at Sources-de-la-Seine near Dijon. The latter was dedicated to Sequana, the personification of the River Seine. Between them, these two sites have yielded up several thousand votive offerings. In general, the sacrificed items appeared in two main guises. Often, they took the form of the limb or organ that was diseased. In other words, the supplicant might offer up a wooden image of a damaged hand in the hope that, in exchange, the deity would restore their real hand to health. The second type of offering was the so-called 'pilgrim' figure, representing the actual donor. These ranged from fairly naturalistic pieces, frequently betraying the influence of classical art, to stylized, armless figures, wearing thick, hooded cloaks. Their appearance is reminiscent of the Cucullati, the hooded deities who were worshipped in many parts of the Celtic world. Famous monumental Celtic stonework such as the La Tene style Turoe Stone in County Galway Ireland, the Killycluggin Stone in County Cavan, the Mullaghmast Stone in County Kildare, the Derrykeighan Stone in County Antrim, and the Navel Stone at Delphi, in Greece, is more engraving than sculpture. Likewise the 3-D goldwork of the Broighter boat and other similar artifacts is considered under Celtic Metalwork art rather than sculpture. As for the famous ringed Celtic High Cross Sculptures, sculpted during the medieval period (c.750-1150) of early Christian art, such as the 10th century Muiredach's Cross, the Celtic-style designs (eg. the interlace, knotwork and spiral designs on the South Cross of Clonmacnoise, the St. Mullins Cross, and the Ullard High Cross) are almost all abstract (the few exceptions being zoomorphic images), while the figurative reliefs owe little to the art of the Celts.  For more about painters and sculptors, see: Irish Artists.  For information about the history of stonework in Ireland, see: Irish Art Guide.  For more on the history and types of Celtic sculpture, see: Homepage.